Count Your Lucky Stars and Topshelf Records’ SXSW showcase is scheduled to take place on Wednesday, March 16 from 11:00 am – 9:00 pm at Plush in Austin. 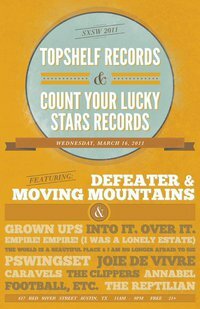 Free if you’re 21+ ($2 if you’re not), the party will feature the likes of Moving Mountains and Defeater. Beyond that, Gotta Groove Records will provide free 7-inches of the bands playing the showcase and Treaty Oak Platinum Rum will be giving away free booze.